The East Coast has remained relatively (and uncharacteristically) cool and fresh this summer; out west, we've simmered and sweated (even in Seattle). Though I've done plenty of complaining about the heat, it's been fun to experience a real summer for the first time in a ... decade? I've been dousing myself with sunscreens, Eaux de Cologne, and perfumes with lots of jasmine, coconut and tropical flowers in them (beach-y things). Into this hot-weather perfume extravaganza, came a sample of Atelier Cologne Blanche Immortelle1 — an autumn scent. Blanche Immortelle is part of Atelier Cologne's Collection Métal which also includes Gold Leather, Silver Iris and Santal Carmin. When I first received my sample and dabbed an arm with Blanche Immortelle, I was not impressed; and I even told Robin here at NST that it was a nonentity and I would not be reviewing it. Weeeeeeell, I realized yesterday I got my samples mixed up; the nonentity is By Kilian Vodka on the Rocks. When I put a real application of Blanche Immortelle on my skin, I was much happier. Blanche Immortelle's immortelle absolute smells heavenly and it is STRONG, without being obnoxious. When first applied, the immortelle has a faint mintiness (unusual, but pleasing) that leads to a tempered-spice accord that reminds me of Indian food (I detect a 'background' note that smells of heated cumin seeds — food-y in character, not "sweaty"). In mid-development, there is a hint of flowers: mimosa, dried roses dampened with a drop of jasmine oil. In its base, Blanche Immortelle presents "culinary" immortelle (scenting a spice cake? flecking a loaf of rustic bread?) And the bitter end? Not bitter at all! Blanche Immortelle's extreme dry-down smells like butterscotch. Blanche Immortelle is more brune than blanche to my nose; its notes are warm, toasted, caramelized (and comforting). With Blanche Immortelle, Atelier Cologne has created a great cool-weather cologne...balmy, but with substance and excellent lasting power. Blanche Immortelle joins my other favorite immortelle perfumes: Annick Goutal Sables, L'Occitane Immortelle de Corse, Etat Libre d'Orange The Afternoon of a Faun and Arquiste Anima Dulcis. 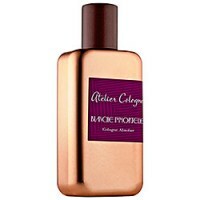 Atelier Cologne Blanche Immortelle is available in 100 ml ($215) and 200 ml ($285) Cologne Absolue (18% concentration). For buying information, see the listing for Atelier Cologne under Perfume Houses. 1. Perfumer Jérôme Epinette; listed notes of bergamot, mandarin, mimosa, immortelle absolute, jasmine sambac, Turkish rose absolute, vetiver, patchouli, Australian sandalwood. 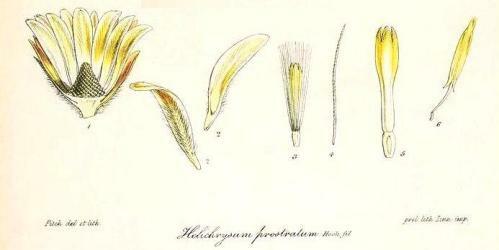 Note: top image is Helichrysum prostratum [cropped] via Wikimedia Commons. I got the chance to try this in the Manhattan AC boutique last week. It was nuanced and interesting, but also if you poured a lot of it over waffles I would probably try to eat them. Definitely brune. I have to say, by the end it wore me out — the tenacity and power are really amazing, and just felt like too much tramping around the city on an August night. Melissa: I wore it on a steamy day too…and it WAS too much. A cool-weather perfume for sure. I have tried a few other Atelier Colognes but not this one (although I have the soap). I wish they would come in a 50 ml size too but I guess that won’t happen as they are marketed as “cologne” and not eau de parfum–even though they are more like perfume than cologne to me. Filomena: lots of them do come in 30 ml sprays…this probably will too at some point. Thanks Kevin. You are right I forgot that the others have the small size. With this particular collection it seems that the 30 ml size only comes bundled with the gigantic 200 ml bottle. I really liked Gold Leather but even 100 ml would be way too much. Jonas: let’s hope that “option” leads to the 30 ml as standalone; really, if someone buys 200 ml…they want 30 ml more? HA! Yes, they have a newer one called Rendezvous that only comes in the gigantic 200 ml bottle, along with the 30 ml size and a small candle for a mere $350.00! Filomena: for the person who only wears ONE fragrance perhaps! It doesn’t make a lot of sense does it? With the regular lineup you can pick a different scent as the bonus which make a lot more sense. I have been tempted to take advantage of that offer but as much as I like this line I can’t justify owning a 200 ml bottle of any of them. What they really need to do is to halve all their bottle sizes. 100 ml, 50 ml, 15 ml would be perfect. It’s hard to imagine how a perfume called Vodka on the Rocks would smell like anything. I forget what it was that LT reviewed and said it was for people who wanted the pleasure of applying perfume without actually smelling anything. Noz: that’s about it…not much there but generic/contemporary department store men’s cologne scent. And the PRICE! Is immortelle the one that can smell like maple syrup? Kevin, I was wondering how this compares to ELO Like This, if you have smelled that one? Noznoz, now I am going to go crazy trying to remember which fragrance LT was referring to, because I remember that quote also! Dzing: ah…it’s been so long. I remember Like This as smelling brighter, less “foody”…I wasn’t a fan of that one, though. Dzingnut, apologies! I usually remember, but in this case I have no clue. Although it was probably something expensive, to be worthy of such an elegant barb. Hard to believe this is a cologne. I tried it as well and wow! was it persistent. I liked it too even though immortelle is not a flower I enjoy. They’re cranking them out these days! Floragal: and that’s the only one I never smelled! Blanche Immortelle is powerful…on my desk where I rested my arms after putting on the fragrance…I can still smell it (two days later). It always makes me want to go eat a cookie. I’ve only smelled this one on a blotter so far. I remember thinking it reminded me of Sables, which I already have. I’d be curious to do a side-by-side comparison and see how different they actually are. sweetgrass: yes, I’d need to do a side-by-side comparison, too. But I do think this is more food-y than Sables. I tried this for the first time in May at the Sniffapalooza event and loved it; however, the minimum 100mL packaging gave me pause and I bought the soap instead. Good news! I will be hosting a split of Blanche Immortelle during the NST Splitmeet sometime in September. I haven’t totally worked out the pricing yet but it will definitely be attractive since I actually got an extra 30 mLs of something else (i chose Gold Leather) with the 200 + 30 mL Ecru Absolu which I am including in the per mL pricing. Cool. How did you manage to get Gold Leather as the bonus? Atelier’s website does not provide the option of any of the metal collection fragrances for the extra 30 ml.